Earlier this summer the Guardian newspaper in the United Kingdom ran a photo essay about scientists working hard to sort out climate change questions. One of the people featured is Wooster professor of geology Greg Wiles in a classic photo first run in National Geographic. 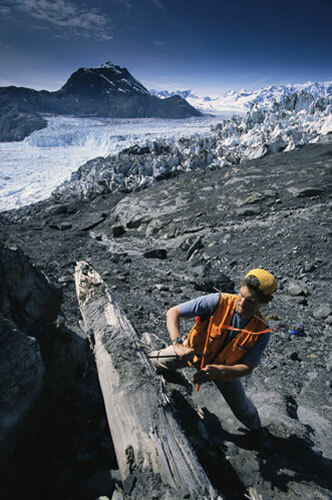 Wooster's own Greg Wiles looking buff as he cores a log in Alaska for dendrochronological and paleoclimate research (from the May 14, 2009, issue of the Guardian). This photograph (and a description of Greg’s work) is now included in a new book titled Climate Change: Picturing the Science by Gavin Schmidt and Joshua Wolfe.